Touch and Go — by DouWère s.p.r.l. Touch and Go is a custom keyboard designed for entering text without switching back and forth between alphabetic, numeric or symbolic views. Soft keyboards were eventually not designed to enter mathematical expressions. For example, a simple A=7*(B+3) requires 20 touches on the original iPhone keyboard. The Touch And Go keyboard uses a new technology that only requires 8 touches for the same entry : you save 65% of your time. To enter the main symbol of any key, just touch it as usual. 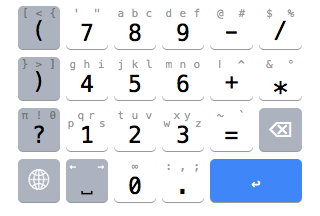 For example, to enter the digit '3' on the '3' key, touch it. The demo is played once at expert speed (fast typing), once at learning speed (slow typing). To enter another symbol of the key, Touch And Go immediately to the left, to the middle or to the right, according to the wanted symbol. For example, to enter the letter 'b', on the '8' key, Touch And Go immediately up. To enter the letter 'a', Touch And Go immediately to the left, slightly up. To enter 'c', Touch And Go immediately to the right, slightly up. Each symbol can also be associated with a customizable word or sentence. ...by downloading the Touch And Go tutorial application, from the AppStore. Runs on iPhone, iPad and iPod. This keyboard design is registered under the i-Depot number 047112 at the BOIP. © 2013-2015, Frédéric Blondiau — DouWère, s.p.r.l.